District Governor John Wilson spoke to us about his goals for the upcoming year and spoke about his long journey with Rotary International. He spoke on how it can be very beneficial for us to work with other clubs in the area on local projects as well commended on how much our club has done for our local community. We will miss you, Joe! Joseph A. Yuppa, 71, an active member of our Club since 1995, passed away on December 20, 2017. 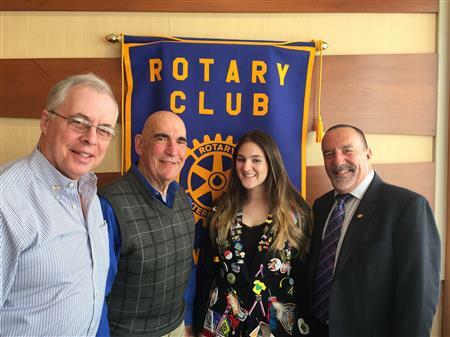 Joe has served as past president, current Treasurer, and was honored as 2017 Rotarian of the year from District 7470 http://montvillerotarynj.org/Stories/joe-yuppa-from-montville-is-rotarian-of-the-year . He was a "make things happen" man, a bit of a MacGyver with his unconventional problem-solving skills, made great lasagna, and loved his wife and family. Joe was talented, energetic and helped others. He was romantic, he was kind, and he was happy. John Misiewicz joined us for our 7:30 am weekly breakfast at the iHop in Boonton and talked about the trails in Montville. When did you last walk on the trails of Camp Dawson or enjoyed the trails behind the Recreation area in Montville. Did you ever wonder who keeps those trails in good condition and continues to provide us with new trails so we can enjoy nature. Our club is definitely willing to adopt a trail and we will walk some of them in Spring to choose the best! On Wednesday, February 28th, at 7:00 pm, the Society for the prevention of Teen Suicide and the Help Educate At Risk Teens will present "Raising Resilient Teens in Challenging Times" at the Montville Township Senior House, 356 Main Road, Montville NJ. This parent presentation focuses on building strength and resilience in our children and teens. 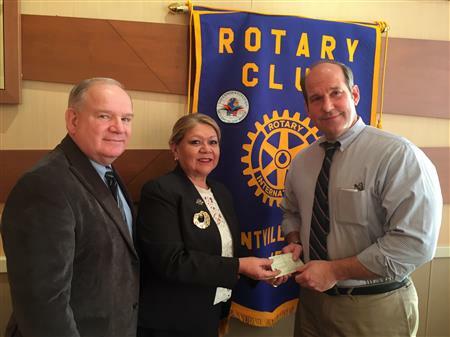 The Montville Rotary Club is sponsoring the program with a $1,000 grant which we received from our Rotary District. On February 20th the Montville Rotary Club's Annual House will be hosted by Boiling Springs Savings Bank from 7:00 pm to 8:30 pm. 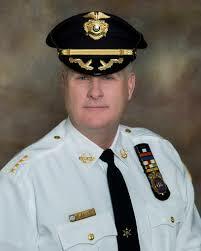 James Gannon, Morris County Sheriff, will provide an informative program and discussion about "personal and family safety - from opioid addiction to traveling the NY subway". 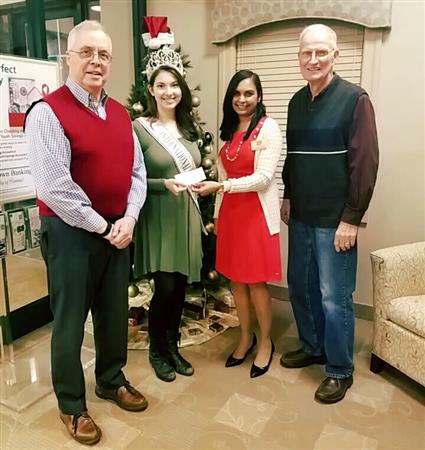 Montville Rotary awards Grant to Help Educate At Risk Teens, Inc.
What a wonderful time at our Christmas Party! We had a wonderful time at our Christmas Party at the Columbia Inn. Great company, good food, and a lot of holiday spirit. 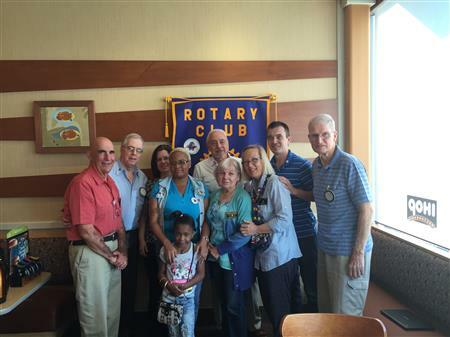 June Witty and Matthew Kayne visited our weekly Rotary Meeting on Wednesday, October 11th, at 7:30 am at the iHop in Boonton. We got to know them, their background, and their platform. They informed us about four issues that are important to them. June Witty talked about the Pilgrim Pipeline which could potentially have long-lasting, devastating effects on Montville. She further pointed out that the ongoing Opiate Epidemic has had devastating effects on Montville residents. Matthew Kayne talked about the importance of a conservative financial planning. He further pointed out that Montville needs to be able to control new development in order for Montville to continue to be a highly-desirable town in which to live. 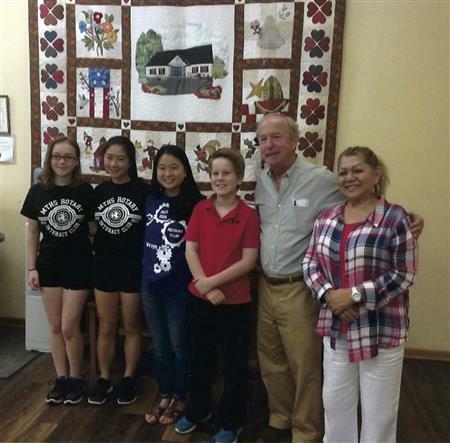 Congressman Rodney Freilinghuysen did not only participate in our Father's Day Pancake Breakfast this year. 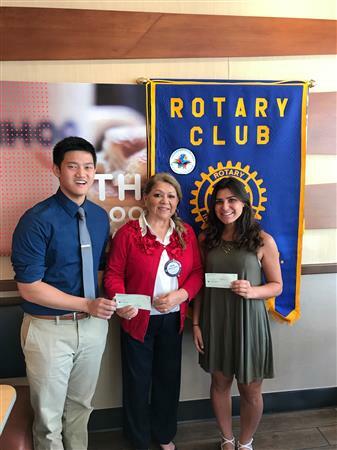 He was so kind to send us a photo he took with our Interact students from the Montville High School, the branch director of Boiling Springs Silvia Cooper (a Rotarian), and Niels Restrepo, a future Rotarian. Dr. Rene Rovtar visited our Club today to explain more about the Referendum. You can read more here. Dr. Rovtar showed us that our schools are in need of repair: roofs need to be fixed, Air Conditioning installed, bathrooms are need of repair. And the state of New Jersey agreed to pay 40% of these costs. Our Blood Drive benefited 76 local patients! A big thank you to all the donors that came to the Senior House on the Friday before Labour Day. We are so grateful to them. We collected 28 pints and therefore were able to benefit 76 local patients with our drive! This was time well spent! and a Big Thank as well to the team of the Red Cross who worked very efficient and always kept a smile - although at times it got pretty busy! We welcomed a new member to our club on Wednesday, Joann Lopez, the branch manager of the Boiling Spring Savings Bank at Montville. 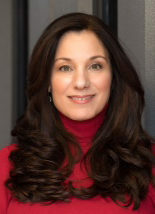 She will be supported by Leigh DelPorto, Marketing Sales Coordinator for Boiling Spring Savings. We are looking forward to continue working with BSSB on the Community Alliance Program, a program which gives us the opportunity to earn money based on the number of our supporter who bank with BSSB - if you bank with BSSB and want to support Montville Rotary Club, please see Joann in the Montville branch. The Montville Rotary Club donated to the Police Explorers all its proceeds of the District 50/50 on Wednesday. Alexander Benno from the Police Explorers visited us at our weekly breakfast meeting. The Explorer Program of the Boy Scouts of America provides young people with solid information about the adult world they are about to enter. The Explorer Program gives young adults a chance to find out first hand about a wide variety of careers. The Montville Rotary Club is proud to be able to provide scholarships to three Montville High School seniors. 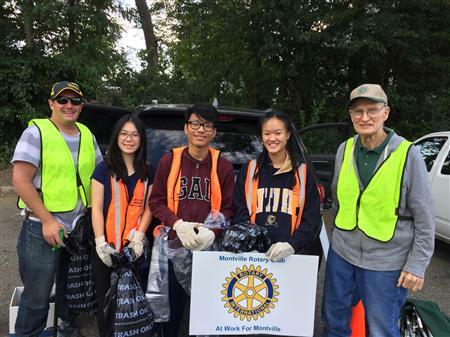 Evan Chan and Serena Huang, the co-presidents of the Interact Club, as well as Jackie Manetta impressed us with their engagement and dedication in school as well as in their after-school-activities. They were engaged in charitable organizations, did sports, supported others and organized activities that would help others. We wish them all the best for their future. 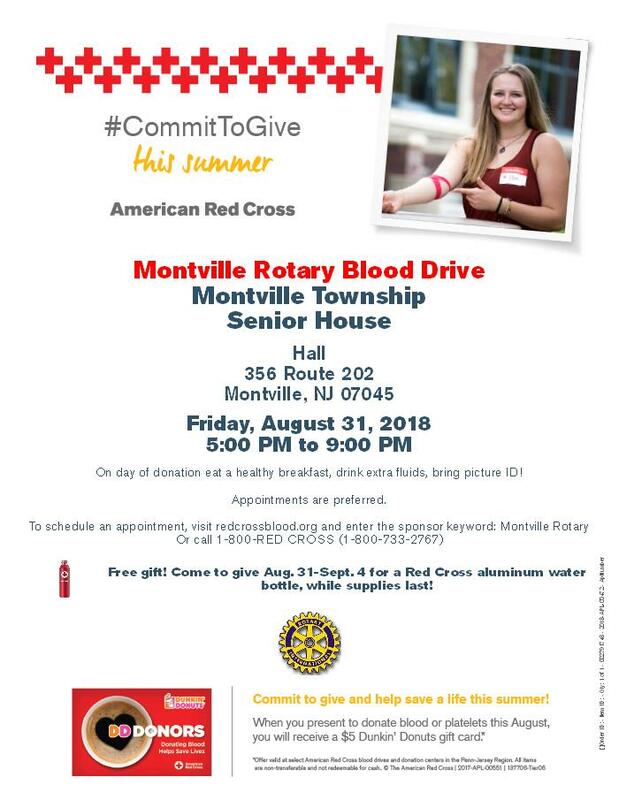 The Montville Rotary Club is organizing another Blood Drive. 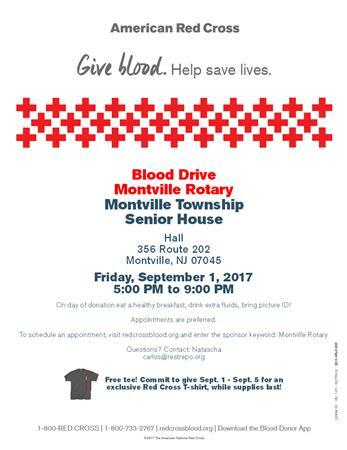 Come and join us on September 1 between 5pm and 9 pm at the Senior House in Montville. During the summer, blood reserves are low. On holiday weekends it gets even worse. Help us to help those that need blood, whether for surgeries or for ongoing treatment like cancer patients. They rely on our help! And this time, you can get a free T-shirt for your effort. Please help us spread the word! If you are 16 and older, you can donate (please bring parents' consent form if you are 16!). If you have any questions, contact us at carlos@restrepo.org. Father's Day Pancake Breakfast - what a great day! Delicious Pancakes cooked by the Montville Rotarians, good service by the MTHS Interact students, and a lot of fun. The 39th Pancake Breakfast was another successful day for the Club, its Members and Friends. And the Montville Rotary Club can now continue to put "Service Above Self" - this year the proceeds will help to fund scholarship for our Montville Highschool Students. Thank you to everyone for coming. The Montville Rotary Club is proud to announce that our member Joe Yuppa was awarded the honor of Rotarian of the Year from District 7470. 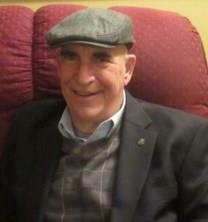 Joe Yuppa has been a Rotarian in the Montville Club since 1995. 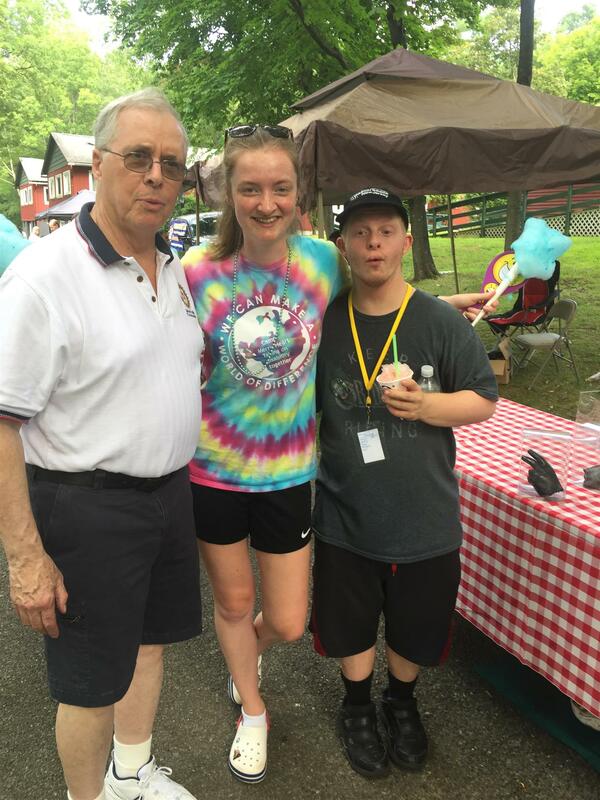 He has held various positions such as president and treasurer over the years and has stayed dedicated to the Montville Rotary Club even after moving away to Stanhope many years ago. He has been organizing our biggest fundraiser of the year, the Father’s Day Pancake Breakfast, for countless years. This yeas the Montville Rotary Club has focused on the growing drug addiction problem our society is facing. We were able to donate $1,000 to the First Aid Squad to purchase Narcan, a drug that reverses the effect of an opiod overdose. We visited the Market Street Mission in Morristown to learn more about the support the Mission is giving to homeless and addicted men. And we now listened to speakers from New Pathways Counseling. 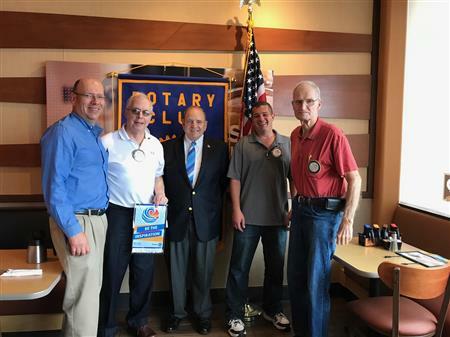 During a recent visit to the Montville Rotary Club Montville’s Mayor Jim Sandham and Peter Greendyk, President of the Montville First Aid Squad, informed to the club about our town’s seven heroin and opiate deaths in 2016 which made Montville the number one town in Morris County with drug related deaths. 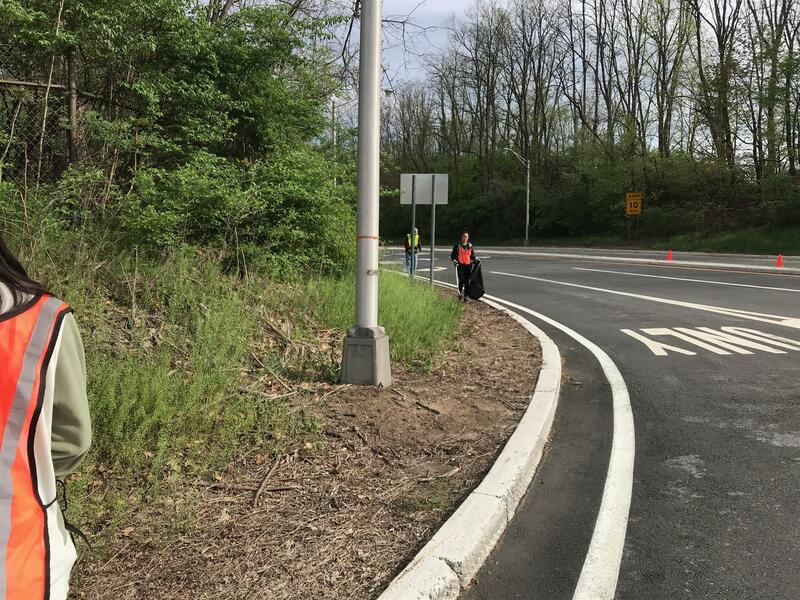 As a community that pledges to put “Service Above Self”, Montville’s Rotary could not just stand by and observe without doing something to try to put our grain of salt to an ever growing problem in the community. 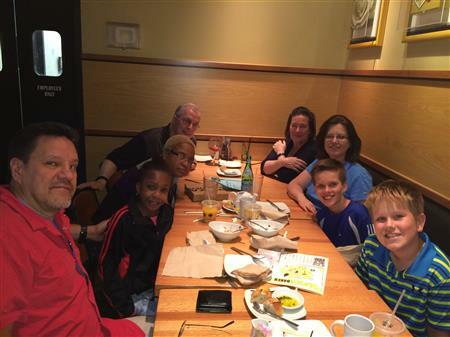 On Wednesday March 1st Strongman and Motivational Speaker Eric Moss was the Speaker at our weekly meeting at the iHop at 7:30 am. We did not know what to expect. Motivational speakers - we are used to them and them well. But we had never had a StrongMan. We were impressed! Eric Moss told us his story and how he changed from a kid in school, bullied by his classmates, to a Strongman. How mentors in his life taught him important life lessons that he was willing to share with us. And then he showed us that these life lessons can really empower you - they empower him to bend steel, nails, wrenches and more. 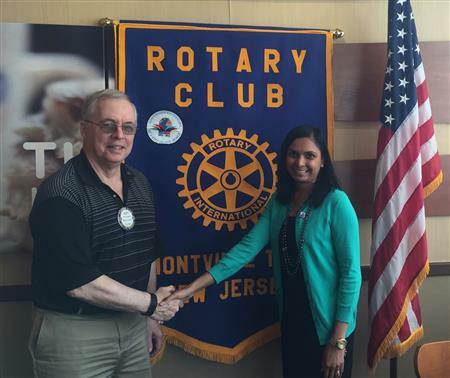 Dave Scott, Executive Director of the Market Street Mission, shared breakfast today with the Montville Rotary Club. He informed the members of the club that the Market Street Mission was started in 1889 (!) and has ever since been reaching out to the impoverished, homeless, addicted and marginalized in Morris County. We learned about the Emergency Services that Market Street Mission is providing as well as their work in the Thrift Store and especially the Life Change Recovery Program. Carlos Restrepo, member of the Montville Rotary Club now for some years, told us this week about his trip to Everest Base Camp and Island Peak. He captured his audience with his photos and stories about people living in remote places of the world who carry everything they need up huge mountains on their back. He told us about the Yaks that can only live in high altitude and whose dung is being used to warm the houses. 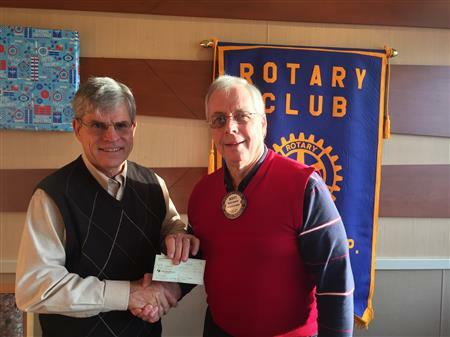 The Montville Rotary Club is now a member of the Boiling Springs Savings Bank Community Alliance Program. This gives us the opportunity to earn money to continue to put "Service Above Self". We earn money entirely through the participation of our supporters. Please support us, it’s simple. Jen Graeff from the Sheep Hill Astronomical Association joined the Montville Rotary Club for their breakfast session on Wednesday, October 26. 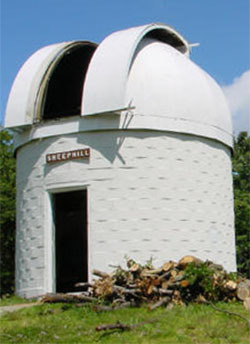 She revealed "the best kept secret of Boonton": There is an Astronomical Observatory in Boonton. And the observatory is open to the public on the third Friday of each month at 7:30 pm. The Montville Rotary Club supported the Team Hope Walk at Roosevelt Park in Edison. Team Noah walked raised $2,050. 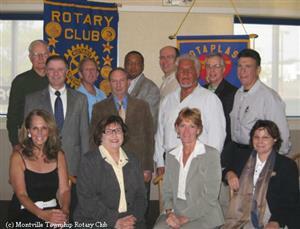 James LaSala visited the Montville Rotary Club on April 20th to talk about ESSEX, the Eastern States Student Exchange. He was accompanied by Luiza, an exchange student from Brazil. 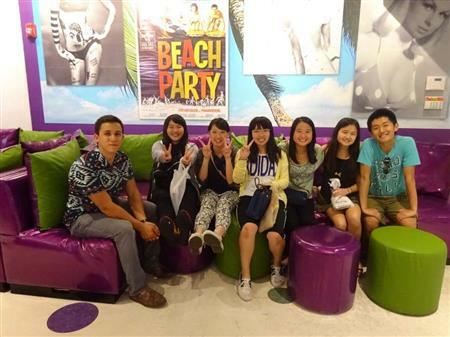 The Rotary Clubs around the world are very involved in hosting exchange students. In our district, we will welcome two LTYEP students for next year. A girl for Belgium will be hosted by the Madison Club and a boy from Germany will be hosted by Denville and Denville Sunrise Clubs. Our newest member, Jerry Toscano has agreed to take responsibility for the Public Relations activities of the club. 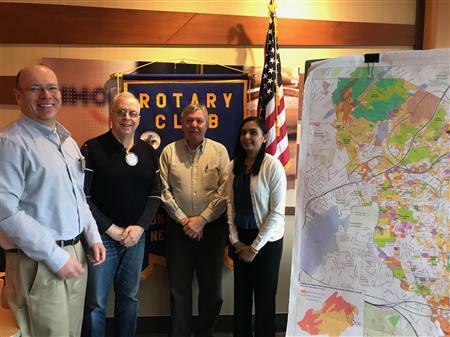 Working in real estate, has given him some connections and ideas to help increase Montville Rotary's visibility. Maureen Kelly-Raso was inducted as president of the Montville township Rotary Club. Maureen is no stranger to the office of club president and to other offices in the District. Most recently she was the Assitant Governor for this club and 4 others. Have you read the story in the Rotarian Magazine? Millions of people have "Nowhere to go?" Not a pretty picture. What is Rotary doing about it? Check it out. Mastering the Art of Community Service- High school students in Rural France-Their story. These and many other stories are there for a good read. Give it a try. All materials and photos, unless otherwise specified, copyright of Montville Township Rotary Club.